WDBF is completely underwritten by individuals and companies in our community. We receive no financial support from any government agencies. Our initial startup costs—which included our transmitter, Emergency Alert System (required by law) and sundry broadcast equipment—were covered by our Legacy Underwriters. 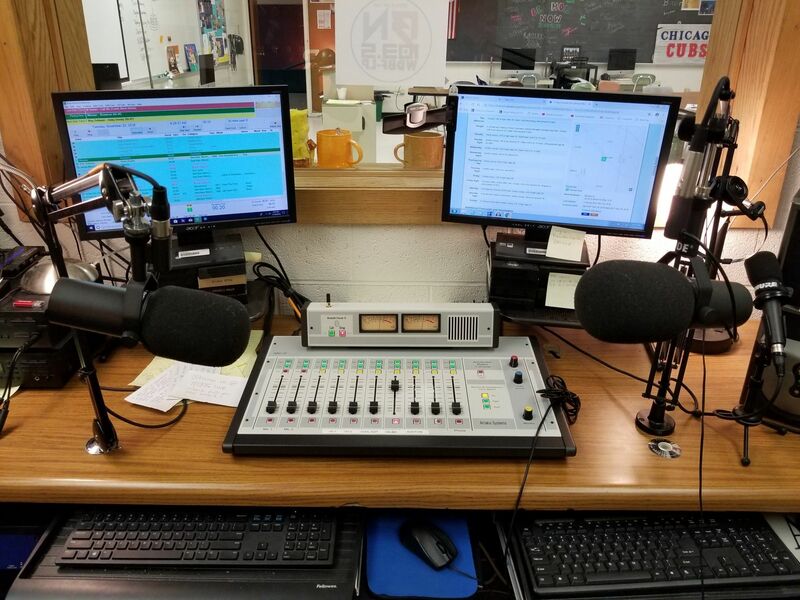 The “big ticket items” like our current broadcast board, compressors, and sound equipment were graciously donated, installed, and are maintained by Jim Crocker of Rockford, Ohio. We would not be on the air without his hard work and commitment. As we received more underwriting support, we have been able to upgrade our in-studio monitors, broadcast microphones, computers, and automation software. Bellmont High School is currently undergoing major renovations and the station will have new broadcast/production studios. WDBF’s recurring fees are our broadcast licensing fees for the major music publishing firms that collect broadcast royalties (BMI, ASCAP, and SESAC). These fees are close to $1000 annually. And finally, as WDBF expands into the realm of digital streaming, we will have additional costs, including licensing fees that are separate from over the air. All the work done at the station is on a voluntary basis. We have no salaried or paid employees. All donated funds are poured back into the station. If you or your business would like to support local broadcasting and help provide career pathways for North Adams students, please contact us at underwriting@1035.live and we can create a suitable on-air acknowledgement of your support. WDBF is a non-commercial entity and as such we cannot advertise products or services with what the FCC identifies as “A Call to Action,” but we can identify your business or individual services, your location, and the nature of your business and recognize your financial support. If you’re familiar with NPR or PBS, you’ll “get” how we can recognize your support. WDBF hopes to be able to move into the new studios no later than fall term of 2019. We are in need of a new (or at least newer) broadcast board. While our current board is a 35-year-old RBS warhorse, parts no longer exist for it and we would love to retire it and expand our production abilities. Please help us upgrade our new studio and, in exchange, we would welcome you or your business to our family of Legacy Underwriters who receive on-air acknowledgment at least twice a day in perpetuity.